Servers | Tygem | The 9th Tong Yang Life Insurance Cup (Last 4) : "hope(P)" vs. "ddcg"
The 9th Tong Yang Life Insurance Cup (Last 4) : "hope(P)" vs. "ddcg"
If you watch his games closely, "hope(P)" is the most impressive player in the tournament so far. I mean he didn't give his opponents any real chance or the slightest hope to win. His style is like a flowing river, because all moves are so natural. It's like a strange feeling that the other side is always a move behind. Which is the best way to combat such a style? I have no idea. Until now, I saw the same movie: The power, that erupted from the simplicity of his moves, made his opponents to dance on a wire, while they sought to balance the game. That kind of risky dance made the games more interesting for the viewers, but was not effective at all. 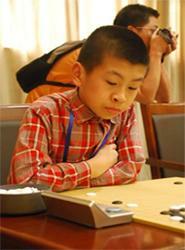 "hope(P)" seems to be a very mature player, but what if tomorrow we find out that he is an 8 years old Chinese boy? This is only half a joke, because this fantastic young generation of Chinese players turned upside down all my misconceptions about GO. Look at "ddcg" or "Strive(P)" for example. In my mind they were more mature or older than they really were. I even published once a picture of "Strive(P)" under the appearance of wise Confucius! They are amazing. Did "ddcg" have a bad day today or does he need more experience to defeat such a player like "hope(P)"? 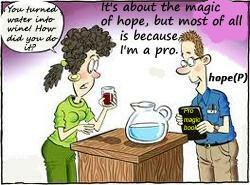 A new question is bothering us now : Who is "hope(P)"?